This ritual is for adults only. Don’t forget to bring a towel! Please join us at Lake Anza, where we will, as a community, immerse in living waters in preparation for the deep and sacred observance of the High Holy Days, which begin with Erev Rosh Hashanah at sundown on the day of the Mikvah. With prayer, song, and silence we will engage in the embodied act of spiritual purification, through immersion, in order to come more fully and mindfully into the experience of the High Holy Days. This immersion is open to both men and women. 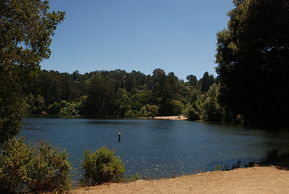 Bathing suits are required at Lake Anza. You may find this ritual more meaningful if you bathe immediately prior to coming to Lake Anza, removing anything that separates your body from the water, such as make-up, jewelry, nail polish, etc. See the full list of our High Holy Days Programs.